Bronchiectasis is the abnormal dilatation of the airways with associated destruction of bronchial tissue. It has been shown that bronchiectasis is potentially reversible, especially in children. It commonly occurs as a result of cystic fibrosis (CF) however there are distinct pathologies that lead to non-CF bronchiectasis and in this article we will focus on these. For more information regarding CF, please follow the link to our article on the subject. In this article, we will discuss the pathophysiology, clinical features, management and complications of bronchietasis. In the UK, the estimated prevalence of non-CF bronchiectasis is 172/million children aged <15 years. There are several aetiologies of non-CF bronchiectasis, which are categorised below. Generally, the inflammatory response to a severe infection leads to structural damage within the bronchial walls, which causes dilatation. 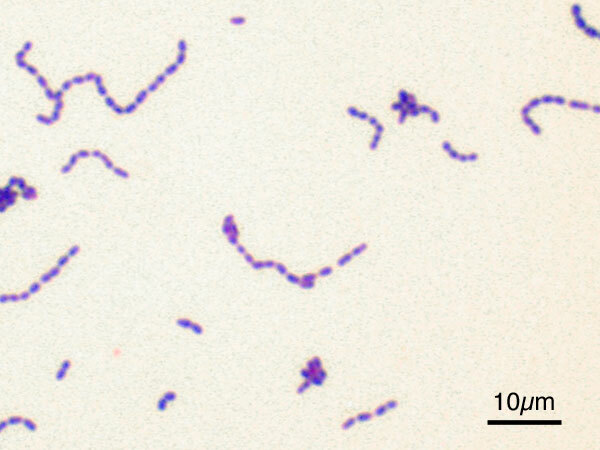 Scarring, which arises as a consequence of the immune response, reduces the number of cilia within the bronchi. This predisposes the individual to further infections. The causes of bronchiectasis given below are mostly either causative organisms of infection, or conditions that place the patient at increased risk of infection. This is an autosomal recessive genetic defect leading to either the reduced efficacy or complete inaction of bronchial cilia. Over 250 different genes are responsible for building the necessary proteins essential for ciliary function. PCD is rare, with an incidence of one in 150,000-300,000 births. In the chest, this causes problems with mucociliary clearance leading to increased susceptibility to low-grade infections and irritation from foreign particulates. Figure 2 demonstrates a CT scan of a patient with PCD. Young’s syndrome: A rare condition associated with bronchiectasis, reduced fertility and rhinosinusitis. 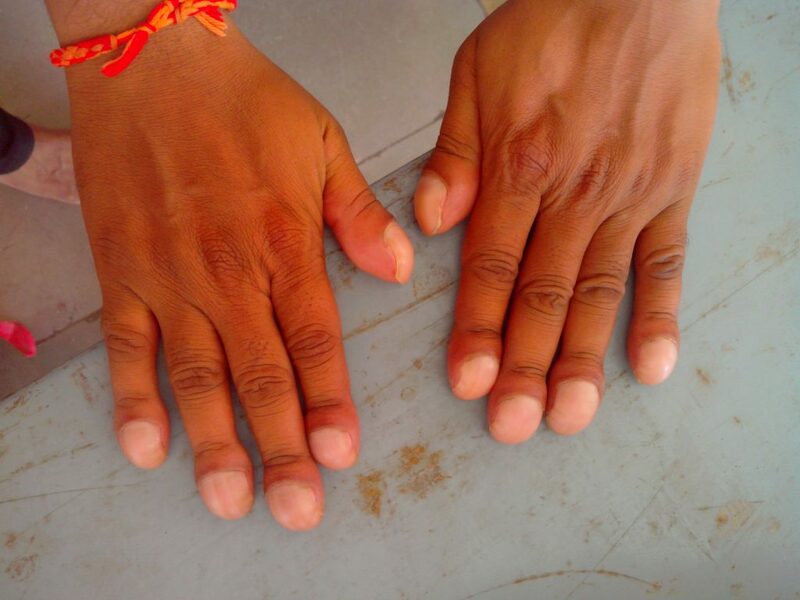 Yellow-nail syndrome: Another rare syndrome associated with pleural effusions, lymphoedema and dystrophic nails. Bronchiectasis occurs in around 40% of patients. Physical examination may be entirely normal but finger clubbing and/or inspiratory crackles may be elicited in children with bronchiectasis. Wheezing can also be heard on auscultation of the chest in some children. The purpose of investigation of children with suspected bronchiectasis is two-fold. Firstly, the diagnosis needs to be confirmed. Secondly, investigations looking for a cause should be carried out. Chest X-ray may show bronchial wall thickening or airway dilatation. However it is important to note that a chest radiograph can appear completely normal in those with bronchiectasis. 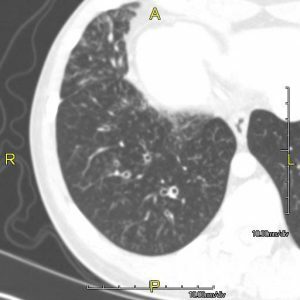 High resolution CT (HRCT) is the gold-standard investigation to diagnose bronchiectasis. Features indicative of the diagnosis are; bronchial wall thickening, diameter of bronchus larger than that of the accompanying bronchial artery (‘Signet ring’ sign) and visible peripheral bronchi. Bilateral upper lobe bronchiectasis is commoner in CF. Unilateral upper lobe bronchiectasis is commoner post-TB infection. Focal bronchiectasis (lower lobe) can be seen after foreign body inhalation. Bronchoscopy is not required to diagnose bronchiectasis and is not routinely performed in all children with the disease. It is reserved generally for children who have evidence of focal bronchiectasis evident on HRCT or when there is evidence of a possible airway abnormality. A chloride sweat test must be performed to exclude CF. CFTR gene mutation analysis may also be helpful if the sweat test is borderline or there is a strong clinical suspicion of CF. Full blood count with leucocyte differential – assess lymphocyte and neutrophil counts. Immunoglobulin panel to assess for immunoglobulin deficiency. Specific antibody levels to vaccinations e.g. pneumococcal or Hib (Haemophilus influenzae B) vaccine. If bronchoscopy is performed a ciliary brush biopsy can be taken. This can be useful in the investigation of children with bronchiectasis as it can give an indication to the underlying cause, for example chronic Pseudomonas spp colonisation should prompt investigations for CF. It is important to understand which organisms are isolated in patients. Much like in CF, chronic bacterial infection can lead to declining lung function and aggressive courses of antibiotics may be needed to treat infection. Spirometry may be completely normal in mild disease. In advanced disease there can either be an obstructive pattern or a mixed obstructive and restrictive pattern, as severe scarring begins to compromise lung compliance. The aims of managing children with bronchiectasis are symptomatic relief, prevent progression of lung disease and to ensure normal growth and development. Unlike CF, there are no clinical trials that demonstrate the benefit of performing chest physiotherapy in bronchiectasis. However, chest physiotherapy is a mainstay of treatment and children should see a chest physiotherapist to learn about mucus clearance techniques and should be encouraged to use them. Children with bronchiectasis should be followed-up regularly and should have continual monitoring of their symptoms and lung function. The long-term prognosis is entirely dependent on the underlying cause. For example, in patients with post-infective disease, treatment should halt disease progression. In those children with more complex underlying pathology e.g. HIV infection, their prognosis depends heavily on the progression of the causative disease. (2) Lissauer, T., & Clayden, G. S. (2011). Illustrated textbook of paediatrics. Edinburgh: Mosby. Which of the following is the incidence rate of non-CF bronchiectasis in children aged <15? Bronchiectasis is associated with which changes to bronchi? Which of the following is the key finding of a bronchiectasis history? A chest x-ray of a bronchiectasis patient may yield which findings? Unilateral upper lobe bronchiectasis is indicative of which aetiology? Severe disease is associated with which spirometry pattern?